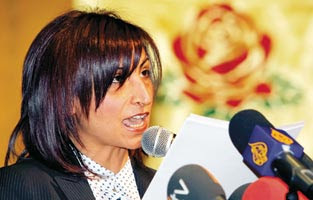 She now faces 1.5 years imprisonment for the speech she made at the party conference in the southeastern city. At yesterday’s (5 February) hearing at Diyarbakır’s 4th Heavy Penal Court, her lawyers rejected all charges; however, she was sentenced to 1.5 years imprisonment for spreading PKK propaganda. The sentence was not deferred. The court had put a halt to the case when Tuğluk was elected into parliament in July 2007. However, when the Supreme Court of appeals overturned this decree, she was retried. Selahattin Demirtaş characterized the verdict as political, and directly held Prime Minister Erdoğan responsible. Demirtaş told Kurdish voters to make their disapproval known at the ballot box come March 29 elections. Tuğluk's conviction follows that of Leyla Zana in December. To make the conviction all the more egregious, Tuğluk was tried before her parliamentar immunity was lifted, and with the conviction, rather than waiting for her term to inspire, the Diyarbakır court that convicted her has petitioned parliament to remove her immunity. TDZ warns that Tuğluk's conviction risks turning her into a martyr in the eyes of the European Union, embarassing Turkey and further complicating its EU membership bid. The Diyarbakır 4th Higher Criminal Court started legal action against Tuğluk over her words at the Batman congress in 2006, but the trial process was frozen since Tuğluk is a parliamentary deputy protected by parliamentary immunity. However, the Supreme Court of Appeals, going against all established legal precedents, overruled the suspension of the case and Tuğluk's trial resumed. Tuğluk was sentenced to one year and six months in jail under Turkey's anti-terrorism laws. The court did not reduce Tuğluk's sentence, arguing that there was insufficient evidence that a future repeat of the offense would be avoided. Tuğluk's situation will now be taken up by the Parliament Speaker's Office. The stance of Parliament Speaker Köksal Toptan will be of utmost importance in this process. Legal experts say that under normal circumstances, no trial process should have taken place before Tuğluk's shield of immunity was removed by a parliamentary decision according to Article 83 of the Constitution. The decision is to be submitted shortly to the Parliament Speaker's Office, which also goes against previously established legal tradition. Normally, a case regarding the removal of parliamentary immunity is first sent by the Justice Ministry to the Prime Ministry and then to the Parliament Speaker's Office, which, traditionally, would send such a case to the Joint Constitutional and Justice Commission. This commission, however, has since 2003 always left such immunity removal cases to the end of the parliamentary term. Typically, the sentence of a parliamentary deputy can only be carried out once the person's term in Parliament is over. The immunity of a deputy can only be lifted by a majority vote in Parliament. However, in Tuğluk's case, none of these requirements were met. The ruling is a "forced" one, according Constitutional Law Professor Ergun Özbudun. "The Constitution says that if there is a conviction, it should be left until after the person's term as deputy ends. Also, there is Article 84 of the Constitution. There is going to be some controversy about what will happen in Tuğluk's case at this point." He said the court ruling was referring to Article 14 of the Constitution, which suspends normal immunity rules in certain cases, and added: "Article 14 has a very wide scope. You can pretty much include everything on it if you push hard enough. I think what she has done cannot be included under 14." He said the Constitution itself was causing part of the problem. He also noted that the parliament speaker will have to pursue legal action once the case reaches him. The DTP petitioned the Parliament Speaker's Office, highlighting that deputies cannot be tried without Parliament's approval. In the statement, written by DTP Şırnak deputy Hasip Kaplan, it noted: "It is legally impossible to try a deputy that has parliamentary immunity. This has given way to a case we had not even seen during the time of the Sept. 12, 1980 coup." Tuğluk will appeal the ruling at the Supreme Court of Appeals. If the high court approves the Diyarbakır court's ruling, Tuğluk will have to go to jail, making this the first time in history that a deputy will have been sent to prison without her immunity being removed. However, Tuğluk's lawyers insist that she can be jailed only after her term in Parliament is over. Zana won the 1995 Sakharov Prize for Human Rights from the European Parliament shortly after her conviction.